Students have been learning about the importance of Safe-School Parking. They've been understanding all about the zig-zags and yellow lines that surround our school. 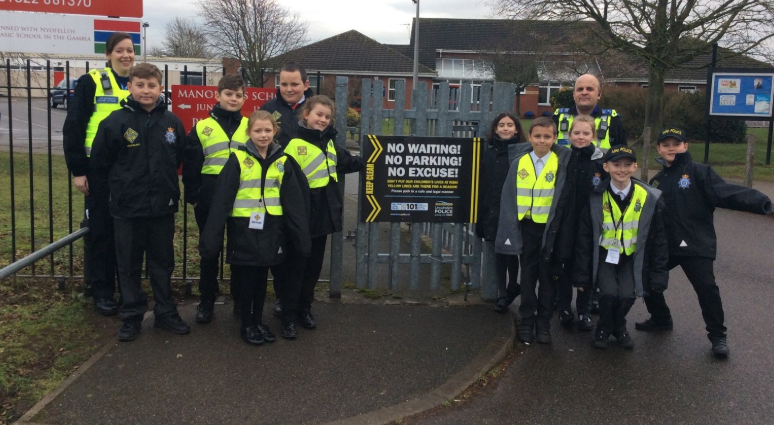 The Manor Leas Junior Academy Mini-Police will be handing notices out to drivers who park incorrectly. It's a great experience for students to be working directly to combat issues which come up in local forums quite often - Mr. Belt. SLOW DOWN PLEASE, FOR MANOR LEAS! Students are being educated by local PCSO, Matt Flack in how to support safe-driving within the school zones. Pupils are going to be using a speed-gun out on Hykeham Road, supported by Lincolnshire Police, to help identify over-the-limit drivers. If drivers can hear how just how potentially dangerous their driving can be, from the very students who could be at risk, it’s an incredibly powerful movement! 10 students in Upper KS2 have been voted for by their peers to become the school’s Mini-Police! – Learning about all aspects of the role of a Police Officer, as well as to promote positive behaviour and actions around school. They even have their own department within our fantastic, new Student Council! “This is a fantastic scheme to empower our students, build aspirations as well as help grow their social confidence. There is also a huge element of positive peer mentoring, as both Year 5 & 6 students are out on playground patrols together!” – Mr. Belt, Yr5 Teacher. The SRT (Safer Roads Team) was launched by Lincolnshire Police earlier this year to tackle the Fatal Four: drink/drug driving, mobile phone use, excess speed and not wearing a helmet. Our students are incredibly excited for this opportunity and have been learning all about the Fatal Four. Additionally, they’re being mentored by PCSO Flack on how to carry out traffic stops safely and the most understanding ways to deliver appropriate questions in relation to these traffic offences.